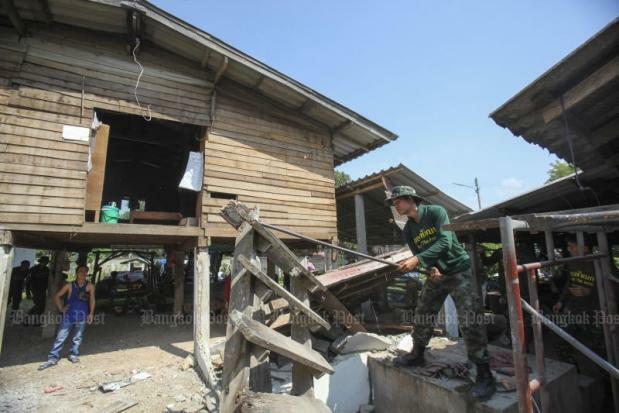 An earthquake damages houses in Mae Lao district in Chiang Rai on May 8, 2014. All provinces in the North and the West are vulnerable to powerful earthquakes as a result of shaking “blind” faults that have not been officially recorded, a prominent seismologist warned on Friday. He warned that any new building construction in the region should put more emphasis on earthquake-resistant engineering to limit the damage if they are hit by quakes. Pennung Warnitchai, a seismologist at the Asian Institute of Technology (AIT), said it is understood among seismic wave scientists that earthquakes “could happen anywhere and anytime”. This is despite the fact that many places are not located close to faults as there are many “blind” faults under the earth which cannot be detected or their locations established by scientists. Mr Pennung said scientists believe it is possible those blind faults are located in all provinces in the North and West. “I can say that all provinces in the North and the West have a chance of being hit by quakes with a scale of 6.5 magnitude caused by those blind faults and up to seven where faults have been detected,” he said at a seminar on earthquakes and preventive measures. The Engineering Institute of Thailand and the Thailand Research Fund organised a seminar on “Earthquake Management and Disaster Mitigation”, which shared earthquake studies with the public. Their suggestions will be submitted to relevant agencies which have been encouraged to implement proper measures to limit losses. Legal amendments to ensure quake-resistant building construction should also be considered in response to these facts, he said. He said Thailand could have the same strength of earthquake that hit Japan last month with a magnitude of over 6. However, Thailand’s preparedness to respond to a similar disaster is different, especially when it comes to quake-resistant construction. He added that the quake with a 6.3 magnitude that hit Chiang Rai province in 2014 was a warning sign for all related agencies to strengthen building construction regulations. The local administrative organisation in the province later issued regulations that any building with three storeys or more should be constructed based on a quake-resistant system. Similar regulations are expected to be promulgated for other provinces that have a high risk of earthquakes. He said the challenge is how to manage buildings with two storeys or single-level buildings as there is no law enforcement in these cases. The public needs to be educated about the risk of quakes and make sure they undertake sound preparations. In Bangkok, the seismologists emphasised concerns over large earthquakes a long way away due to the influence of soft mud in the capital, which could amplify the power of earthquake by four times. According to the AIT’s study, it has predicted that 17 high-rise buildings in the capital will collapse if there is a strong quake. Mr Pennung said the study was undertaken two years ago, but more information needs to be gathered to predict possible damage, particularly regarding the soil.